Sophonie, she scratches words on peach-colored concrete with a sliver of yellow chalk. Jeffrey’s fifteen, he says. He speaks English. I ask how long he’s been here at the orphanage. “Two years,” he answers. He carries a Creole-English dictionary. He and Sophonie speak to each other. “She doesn’t understand you,” he says. I want to know his story. But I’m afraid to ask. Afraid to dredge up memories. Afraid I’ll cry. I look up at Jeffrey. They exchange words in Creole. His tooth aches. I open my mouth, and point to him. I peek in to see what looks like a big cavity in a back molar. I don’t understand his words. Fanfan shrugs and shakes his head. Either he won’t tell or he doesn’t know. “Wait. Stay. Rete.” I go in search of some children’s acetaminophen. I bring back two tablets and tell him to chew. What else can I do? For a few moments, he stretches out, belly down, on the ledge. I worry that he’ll fall. And then he’s gone. I reach into my bag and pull out a packet of Wet Ones®. They’re so excited. They wipe their faces, hands, legs, feet. It’s one small thing in this one small moment. So I sing Jesus Loves Me. And Jesus Loves the Little Children. And Amazing Grace. As they catch the tune, they respond in Creole. And they are an angel choir. 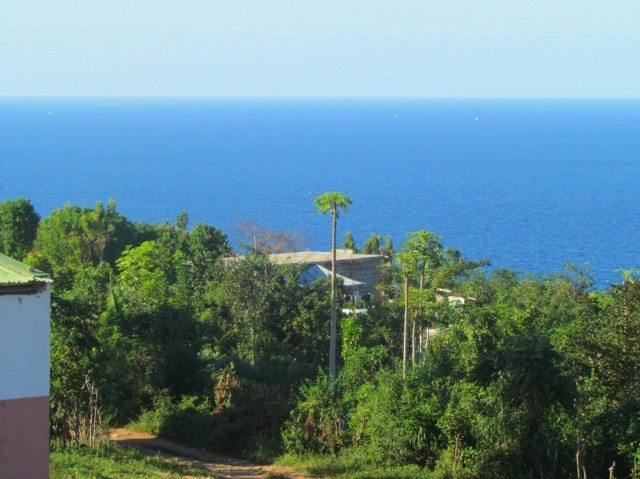 Their voices flow down this Haitian hill, over the chickens, past the infirmary, and out to sea. Later I ask Sophonie where Fanfan is. For a few moments he rests, free from pain. But is it enough? My heart aches. But to be present it this moment, it is enough. And God’s her father and her mother and her everything. Thanks for coming by, Sandra. This was my first time out of country, let alone immersing myself in another culture like this. Lifechanging! What an experience you’ve had. Rest up a bit, friend, and then let it pour out whatever way it comes. This is a lovely, lovely start. Thank you. Thank you, my friend. I have the blahs today. Not sick, just blah. Reentry syndrome maybe? Exhaustion on every level, I’m guessing. Too much at once can simply overwhelm all systems and trips like this are exactly that – too much at once. But there is no other way to do it. . .so rest, cogitate, pray, love your family and relax into home . . . without guilt. Prayed for you several times last week. My seventeen year old son may have passed you in an airport. He went down on Saturday. Enough…to release the great need to God and know it is enough, He is enough. Lord, I believe, help my unbelief. I know those prayers were holding me, Deanne. That first day–I wanted to come home. That last day–I wanted to stay. But He is enough, yes. Here. And there. Lifting a prayer for your son. Full and empty, simultaneously. That’s how I feel when I read your words. How you must be feeling too. That’s exactly it, Cheryl. Full–and empty. Oh, everything said and all that is unsaid hangs heavy in the air here. What a blessing you must have been to those children. What a blessing you are to us. Oh, what a blessing those children were to me. I’m seeing now through new lenses. I’ve sort of been boycotting social media for the past week–so much sadness, so much debate, so much inadequacy at finding words to make it any better. But this is the question, isn’t it? “Is God enough?” Looking forward to reading more. Praying for your re-entry, dear friend. We got the news Friday while still in Haiti, and someone mentioned how much safer we were, it seemed, there than at home. There are no words. There is only the Word. Lovely. I’m so glad for your experiences in Haiti. Smiling here… 🙂 Love this.